I loved my experience trekking to the summit of Mt. Kilimanjaro. The bonds I shared with my teammates and guides, the gorgeous vistas, the epic six-day adventure itself, and the sense of accomplishment I had when I reached Uhuru Peak were just some of the highlights of what was truly an amazing moment in my life. However, the two days I spent in the national parks of mainland Tanzania and the five days I spent in Zanzibar as a part of my extension after my trek were just as incredible, in not more so. - An accurate depiction of my safari experience. Ok, so I wasn’t actually ever in a scene of the Discovery Channel (fingers crossed for that one day), but it certainly felt that way! 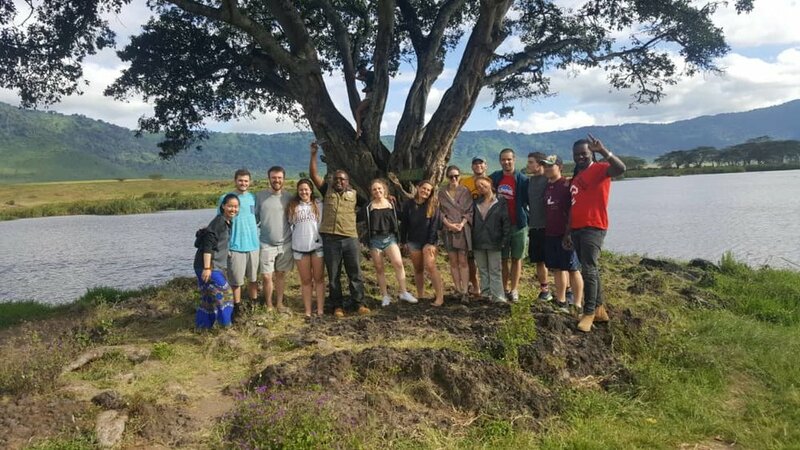 Our two-day safari took us through both Ngorongoro Crater National Park and Lake Manyara National Park as well; they are each as beautiful as they are teeming with wildlife. 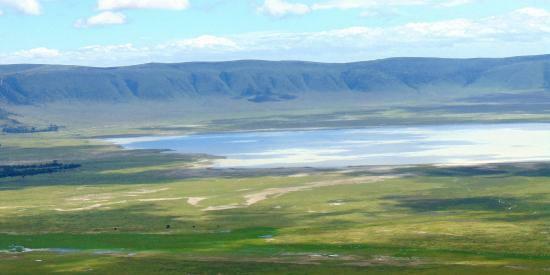 The amount of animals I came across during the days I spent in these natural havens has never ceased to amaze me. Deciding to go on the extension was a no-brainer for me; I already made it all the way to Tanzania and climbed Kili so why not take full advantage of this opportunity while in this corner of the world? That was easy for me to answer. When our safari vehicles arrived to pick us up in Moshi though, I was all the more certain that I had made the right call. After a night of celebrating our successful climb with our team, receiving our trekker certificates, and saying our farewells to those who were heading home in the morning, in came two heavy-duty safari trucks at the crack of dawn. As we would soon learn, the morning is the best time to view wildlife because open areas are much cooler, and therefor easier to traverse for animals, than they are in the middle of the day under the beating sun. Anyways, as we all hopped into these safari trucks, six of us in one and seven in the other, I had a feeling we were about to do something special. We descended right into one of the most beautiful places I have ever seen and right away we started to see animals that seemed to come straight out of a David Attenborough documentary. As we meandered through every region of the park, with me happily sitting on the edge of our vehicles roof filming literally everything I saw, we came across huge herds of zebras and wildebeests, gazelles prancing across open fields, families of elephants, bands of baboons, hippos wading in lily pools, ostriches, buffalo, a rhinoceros, and even a pair of female lions that decided to make a pit-stop right in front of our truck. There were countless more and each time we came across a great opportunity to view a particular animal, our driver/guide was quick to stop, silence our engine, and gives a bit of background information on the amazing creatures in front of us. It was truly a wonderful day! We ate lunch in the park, continued our travels around the crater basin as the sun sank low in the sky, and then we left to be taken to our new accommodations near our next day’s destination, Lake Manyara National Park. After we spent the night outside of the park essentially “glamping”, we were met by the same safari guides from the day before who again quickly took us to our second gorgeous park. In contrast to the Ngorongoro Crater, the area around Lake Manyara is more densely vegetated with forests and fields of tall grass that surround the lake, at least in the areas that we traveled to. While this does obscure one’s view of the animals in these areas a bit, it makes for some striking scenery and is also responsible for one of the parks most famous features, the tree-climbing lions of Lake Manyara. I personally enjoyed this day just as much as I had the day prior. On this day we were able to observe many of the same animals in this new setting but we were also able to find a family of giraffes, several different species of monkeys, and some up-close encounters with huge hippopotamuses. 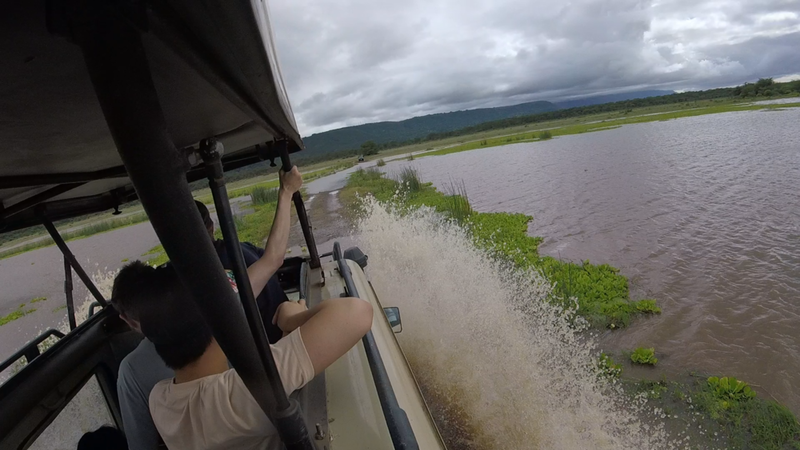 The latter event was my favorite moment of the day as our safari guides took full advantage of their trucks’ capabilities and took us for a ride through the swamps surrounding the hippo pools. It was an absolute blast! Don’t get me wrong, I loved every second of my two days exploring the national parks of Tanzania, but Zanzibar was a whole different ball game. I had always wanted to travel to a tropical paradise and spent much of my free time planning trips to such places leading up to my trek, but even then I was not prepared for how amazing the island of Zanzibar really was. A short flight from the mainland, we touched down on the island just outside of Stone Town (I’ll get to that in a bit) and were driven by our in-country Choose A Challenge representatives to the Sunset Kendwa Resort on the picturesque northern tip of Zanzibar. This was a recurring theme throughout my entire stay in Tanzania, we never had to worry about finding transportation because it was already arranged for us at each checkpoint along our journey. It was a beautiful drive to our resort. As the sun began to set on our long day exploring the country, we drove by rows upon rows of palm trees, some unbelievably tall, and continued past massive groves of banana trees; it seemed as if everything was green and thriving. Our drive was made even more enjoyable when one of my team members took it upon themselves to take over as our van’s personal DJ until we reach our destination. When we got to our accommodations that night I didn’t know what to expect from the Sunset Kendwa. To be honest I didn’t really know much about the place before we got there other than the fact that we’d be staying in beachside “bungalows”, whatever that means. I found out soon enough. Once I saw my room I thought we were being treated like royalty! That first night we were tired and hungry, treating ourselves to pizzas from the resort’s extensive menu (something several of us had been craving since the our second day on Kilimanjaro), but we didn’t do much other than eat and sleep. I did, however, go for a moonlit walk on the beach, marveling at where I was and also thinking about what laid in store for me the next day. Among the many different things that I chose to do in Zanzibar, one of my favorite experiences was swimming with sea turtles in a protected sanctuary that ebbed and flowed with the tide. Although only three of us decided to go on this excursion, I had a blast interacting with these gentle and amazing creatures! We began by feeding the 40 or so turtles handfuls of seaweed from the edge of the sanctuary but then quickly hopped into the water with them, led by one of my braver companions. 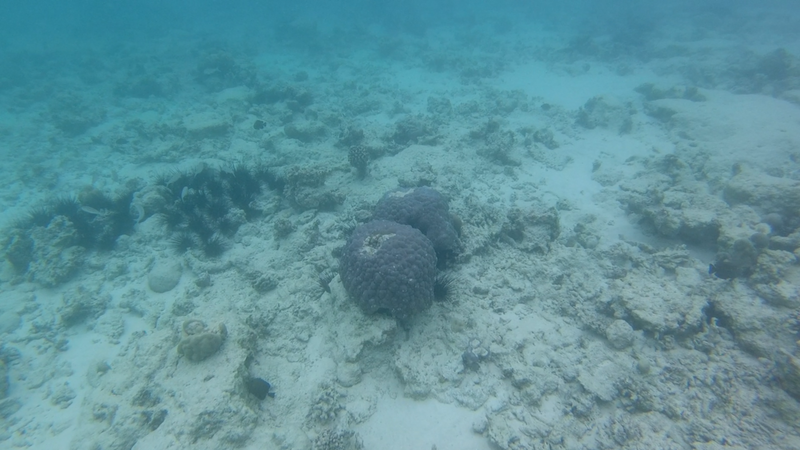 After a short adjustment period, as it initially did feel a bit odd having the turtles swim all around us, we settled in and swam alongside our new marine friends. Just having the opportunity to engage with these sea turtles was a very special experience for me; it is truly a moment I will never forget. Disclaimer: It is best not to wear a green bathing suit. Doing so can confuse the sea turtles into thinking that it is seaweed and they might bite you, as my friend and I learned the hard way. Their bites aren’t very painful but trust me, you’re better off leaving the turtle sanctuary without bite marks. On another day we left directly from the beach of the Sunset Kendwa, boarded a small sail boat that looked like a pirate ship, and then headed to a local island for a snorkeling adventure. This was my first time ever doing anything like this and it certainly won’t be the last. After sailing along the coast of Zanzibar, we approached a small island and dropped anchor. The water was so pristine and clear that I immediately understood why we had stopped here; there was a huge coral reef right below us! I took my time getting my flippers and goggles on but could not wait to leap into the water and join the rest of my team who were already off exploring the sea floor. I jumped off the top deck of our sail boat and crashed into the water. As soon as I threw on my goggles on and could see what was beneath me, I tore off through the water. 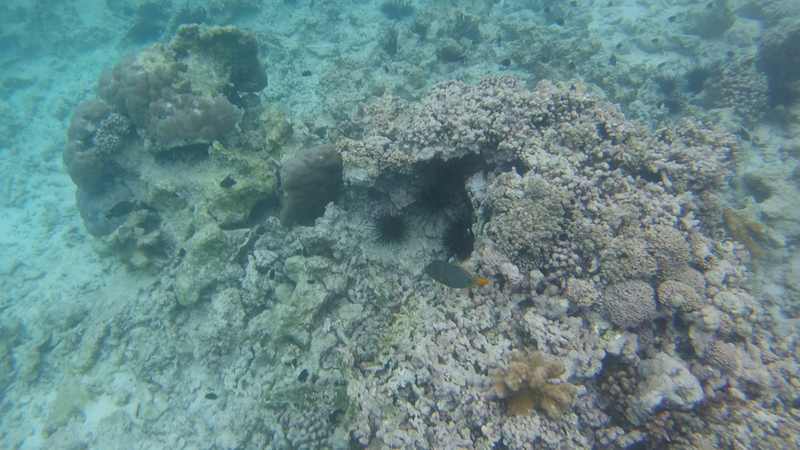 All around there were countless kinds of exotic fish swimming in and out of coral dens, calmly moving away whenever my curiosity got the best of me and I had to go in for a closer look. This also bears mentioning, the water around Zanzibar and Tanzania is unlike anything I have ever experienced; it is by far the warmest, clearest, and saltiest ocean water that I have ever swam in and to this day it is one of the things I miss most from my stay. After the rest of my team decided it was time to get out of the water, (I was still swimming when I realized there were only two of us left) we boarded our pirate ship once again and sailed off to a distant beach for a barbecue with other groups that had also been snorkeling with us. Over fresh fruit, rice, some sort of curry, and grilled fish from that day’s catch, we joyfully reminisced about our ocean adventure with friends and strangers alike. We relaxed, went for some walks, played in the sand, and then started our long voyage back to the comfort of our resort. This was arguably the best day of my entire stay in Zanzibar. Another amazing opportunity we all took advantage of was a trip to the World Heritage Site of Stone Town and the nearby Prison Island. On this day we were picked up at our resort and headed to the other end of the island, where we were to go on a guided tour of the history of Stone Town. Once there, we sat down for a traditional Tanzanian lunch and began our journey around the city, learning about things like the House of Wonders, the four different kinds of doors used in the city, the origin of the name “Stone Town”, the history of the spice markets, and even the house Freddy Mercury was born in (hopefully now that Bohemian Rhapsody is in theaters most of you know who I’m talking about). At about midday we took a short boat ride to Prison Island, one of several islands situated around the city harbor and one with special significance. Learning about the history of the island was amazing but the best part of the island in my eyes is the fact that it is also home to the second largest species of tortoises in the world. Speaking of gentle creatures, these tortoises were incredible both in terms of their sheer size but also long lifespans, with several of them over 100 years old! It was a unique experience to be around animals that have survived so much. There were many more lifelong memories that I forged during my extra week in Tanzania, far too many to fit into one post, but these were the ones that stood out to me the most. All in all my extension experience was unbelievable and I couldn’t have asked for it to go any better! If there is anything you should take away from this blog, its that if you are ever traveling around the world and have the opportunity to stay and explore more, TAKE IT! You never know when you’ll get such a chance again.